What is Maalox used for? Maalox is an antacid that contains two active ingredients, algeldrate and magnesium hydroxide, which reduce the acidity of the stomach's juices to relieve problems such as pyrosis (heartburn) and acid reflux. 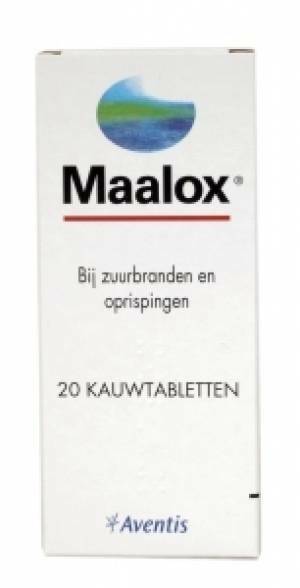 You can buy Maalox online from a Dokteronline.com partner pharmacy. Order today and the pharmacy will have your medicine delivered to you within just a few business days. Stomach acid is produced in the stomach as a normal part of the digestive process. However, too much stomach acid can cause symptoms such as heartburn, throat irritation or pain, acid reflux and bloating. Stomach problems or indigestion are often caused by an over-indulgence in food or drink, high-fat foods, smoking, stress, coffee or excessive alcohol use. Heartburn is also a common problem during pregnancy. Maalox works by binding to and neutralising excess acid. This helps to relieve the pain and discomfort of heartburn and indigestion associated with excess stomach acid. Maalox generally takes effect within 15 minutes and provides relief for one to three hours. one chewable tablet four times a day, two spoonfuls of suspension, or 10 to 20 ml of Maalox Forte suspension. If Maalox does not produce the desired effect, then you should consult your doctor. Read the package leaflet before use. Decreased level of phosphate in the blood, or blood values which deviate from normal (only if high doses are used long term). Do not use Maalox if you are allergic to any of its ingredients or if you suffer from severe renal dysfunction. Consult a doctor on the use of this medicine if you have kidney stones. If you are already taking medication you should consult a doctor before using Maalox to make sure the combination is safe.